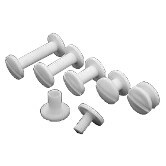 Our large-head push-lock screws are available in black or white. They are ideal for rapid assembly of swatch books, brochures, or nearly any material that needs to be bound together. You can easily assemble them by pushing the post and screw together; threading is not required.